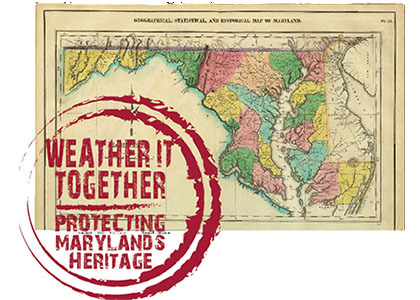 To help protect historic places, archeological sites, and cultural landscapes from the effects of natural hazards, the Maryland Historical Trust offers a Weather It Together program, providing technical assistance to aid local governments in three key areas: hazard mitigation planning, disaster response and recovery, and climate change adaptation. Because of their proximity to water, Maryland's historic places are particularly vulnerable to the effects of flooding, coastal storms, and shoreline erosion. The impact of events like Hurricane Isabel, Hurricane Sandy and the flash flooding in Ellicott City highlighted the need to strengthen protections for the many landmarks, districts and sites that contribute so much to our economy and quality of life. Being prepared for the effects of natural hazards (e.g., flooding and wind), disaster events (e.g., hurricanes or tornadoes), and climate change (e.g., extreme storms, heavy precipitation and sea level rise) enables a community to be more resilient: better able to resist, respond, and recover from a disaster. To assist, MHT has produced a Flood Mitigation Guide: Maryland's Historic Buildings, which you can download in full or peruse by section, according to each of the topics below. When embarking on a plan to protect the historic capital from natural hazards, including sea level rise, the City of Annapolis branded its project "Weather It Together" because becoming more resilient is an ongoing effort that should be undertaken not only by the public sector, but also in conjunction with residents, business owners and other stakeholders in the community. The City has graciously made the logo concept and slogan available to MHT and to all jurisdictions who are undertaking similar work to protect their historic places. Click on the buttons below for tools and information on how to incorporate cultural resources into hazard mitigation planning, disaster response and recovery, and climate change adaptation.